I hope that y’all had a wonderful Thanksgiving. We ate and ate and ate and spent some much needed time catching up with family. I hate that days like Thanksgiving and Christmas fly by, but I am always grateful for any time I can spend with our extended families. Now, I am just so thrilled to introduce a project that I have been working on for a few months now for one of my sweet neighbors… this sweet Monogrammed Magnolia Wreath! The actual monogram came from the fabulous shop, Southern Nest. If you haven’t heard of this shop, you simply most go visit, they make some absolutely amazing monograms! 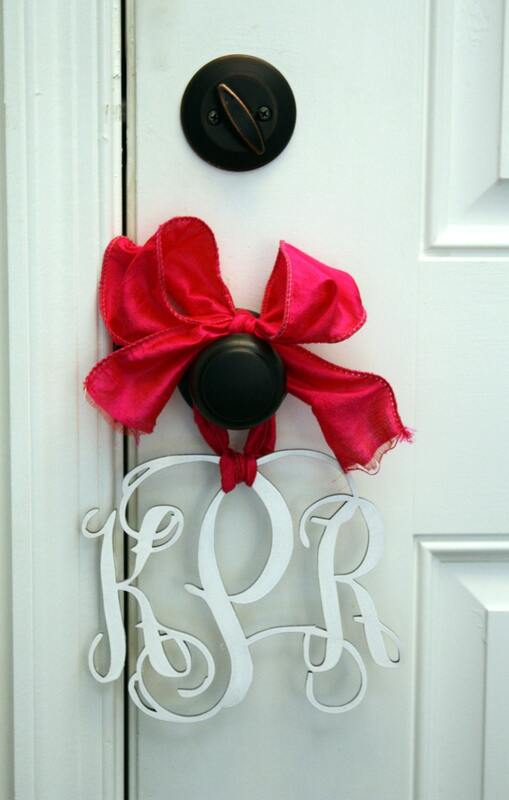 I love everything that they do including this small crafting monogram. I was so excited for the opportunity to work with Courtney at Southern Nest and I chose one of their large crafting monograms for the wreath for my neighbor. I really love how it turned out… so southern and so beautiful! I will be sure to share how to make the magnolia wreath soon! We have some amazing projects to share with you in the next few weeks, so we hope you’ll stop in again! * We were given a crafting monogram to try out, but our opinions are 100% our own!